Disclosure: This is a compensated campaign in collaboration with Flatout Bread and Society Culinaria. Thank you, friends, for supporting the brands that I work with and love! This is the last day of school… Hooray! 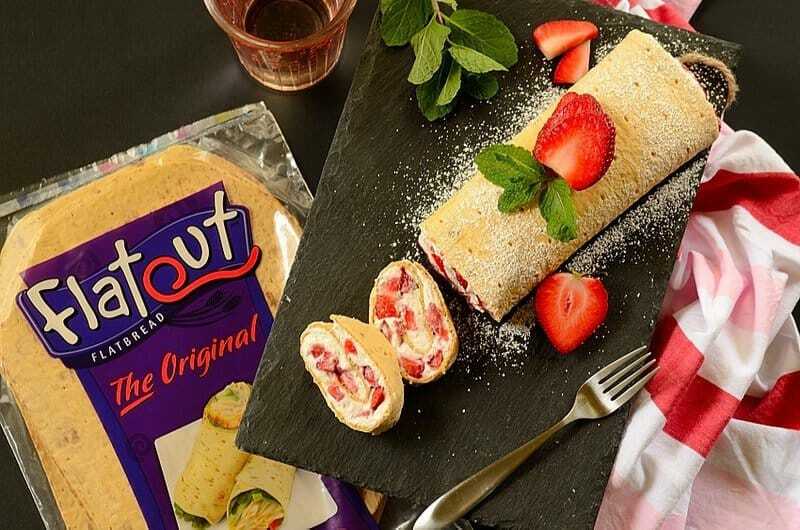 To celebrate in style yet without taking much time from my busy schedule, I made this Strawberry and Cream Flatbread Roll. 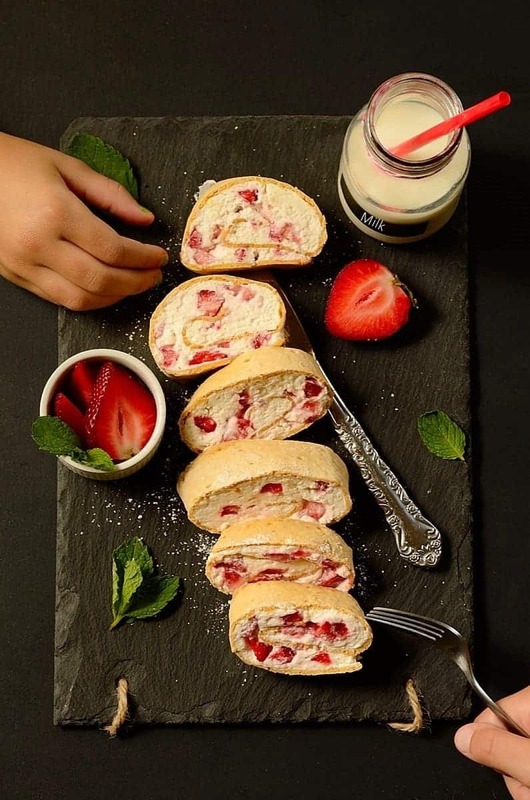 It’s inspired by a popular Brazilian dessert, strawberry and chantilly cream jelly roll (rocambole de morango com chantilly) — but is much easier and quicker to prepare… and oh, so beautiful that my girls fell in love with it (and my hubby too!). I am not kidding! It only took me about 15 minutes to prepare our strawberry and cream flatbread roll. 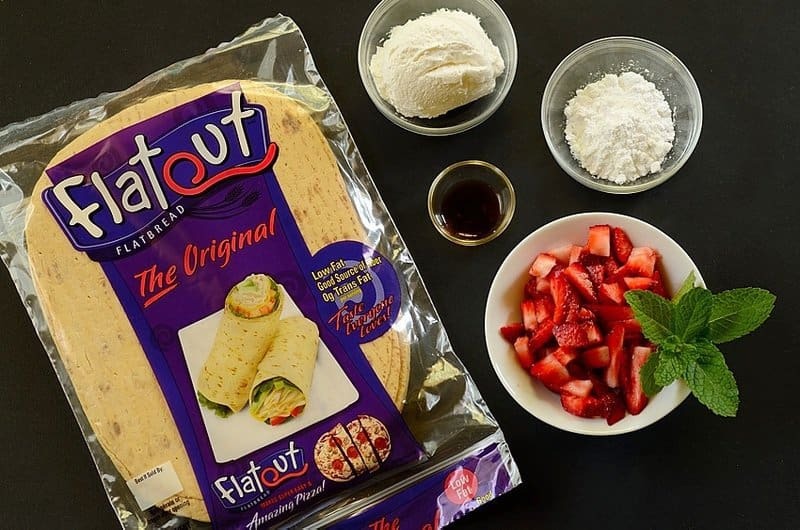 The reason why is I didn’t have to make a jelly roll batter and then bake it: I used Flatout flatbread instead, which has less calories and carbs, and is a blank canvas. It’s the perfect partner for helping people of all ages to make healthier choices… and helping us all to prepare delicious snacks and desserts without fuss. 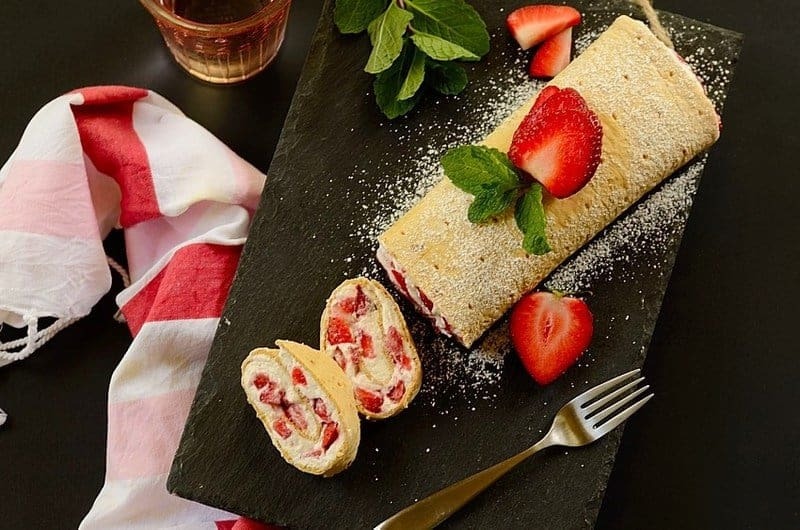 This is a 6-ingredient summery treat made with Flatout bread, chopped fresh strawberries, and a mixture of light whipped cream, cream cheese, powdered sugar, and vanilla extract. And all I had to do was to spread the creamy mixture onto the flatbread, top with chopped strawberries, roll up, refrigerate, and enjoy. Easy-peasy… with a great result, as you can see. All ingredients are available in local supermarkets but you can use this store locator to see where Flatout bread is available near you. My grads enjoyed this strawberry and cream flatbread roll with milk and a huge smile on their faces. Mommy had to sweetened their palates in the same way they delighted me with good grades and behavior the entire school year. I cannot believe they will be heading to third and fifth grade next year… tell me, where does the time go?! We are open to suggestions as well… what flavors would you come up with for you and us? For now, enjoy our happy treat! 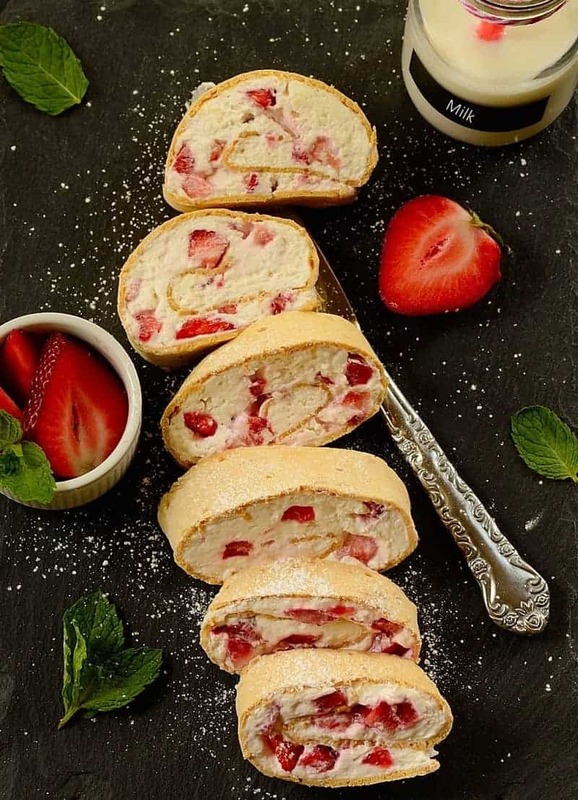 Strawberry and Cream Flatbread Roll is a quick, delicious snack/dessert made with flatbread, sweet cream, and chopped strawberries. Place 2 flatbreads on a cutting board. In the bowl of an electric mixer, beat softened cream cheese and sugar together until obtaining a creamy, homogeneous mixture. Add the whipped cream and beat just until mixture is homogeneous. Stir in the vanilla. Spread half of the cream on one flatbread and the remaining half on the other. Place half of the chopped strawberries on top of one of the flatbreads and the remainder of the strawberries on top of the other flatbread. Roll up each roll. Wrap each roll with plastic wrap and refrigerate for at least 30-60 minutes. Unwrap, sift extra powered sugar on top of the rolls, slice, and serve. Enjoy! Yield: 2 rolls. 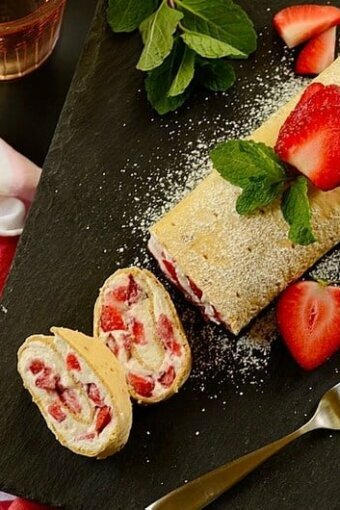 This recipe is inspired by Rocambole de Morango com Chantilly (Strawberry and Chantilly Cream Swiss Roll). At first I thought it was a roulade but it was way more brilliant than that! never had I though using flatbreads on amazing dessert like this, youre a genius. Thank you, Raymund! It is a quick yet delicious snack to have. My family loved these rolls. Another amazing recipe Denise! I usually ignore the flatbread display at the grocery store, but you have inspired me! Have a great summer with your daughters! Deb: Thank you so much. The same for you and your family! This is SO creative! Really fun way to use strawberries, too (and we’re overloaded with them, so we’re looking for new recipes). Really pretty, too. Great recipe — thanks. Wow! What a genius idea of making flatbread roll. This is such a beautiful and deliocus looking flatbread roll. 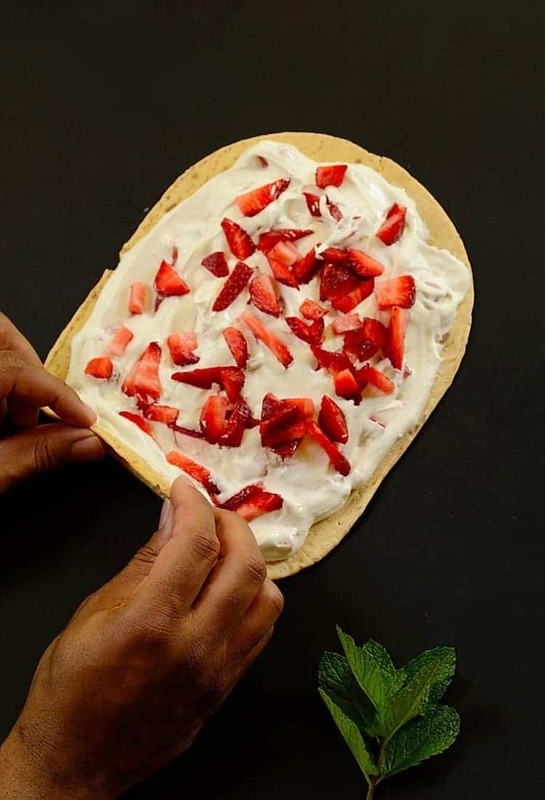 I have never seen this flatbread…but I like the idea of strawberry and cream…very creative Denise. It is available in Target and also Walmart, Juliana! I love both its taste and versatility. Oh…and it’s so easy to make. Well, the key is to have the flat bread, which is not common in our countries, but I really like this idea!!! It looks so great and I never would have thought about using flatbread to make this! So original!